The Government of India launched UMANG App in November 2017. Excellent app is a government app through which people can avail several government services at one place. What is the procedure to check PF balance through UMANG App, today we will provide information about this topic to you through our articles. One particular thing that you have to take special care of is that your register number should be activated by the Employees Provident Fund Organization. This is because you will receive an OTP at your register number while examining PF balance on Umpact app. UMANG App can also be applied for bill payment and new PAN card. 1) First of all, you have to click on the EPFO option in the cool app. 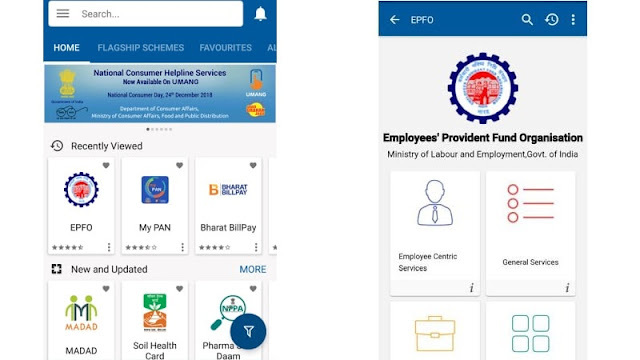 2) After clicking on the EPFO, you have to go to the 'Employee Centric Services' option. 3) After that you have to click on the View passbook. 4) After clicking on Pass Passbook, you will be asked for a UAN number. Enter your UAN (Universal Account Number) number. 5) After entering the UAN (Universal Account Number) number, click Get OTP. 6) After this OTP will be sent to your register number. 7) Enter the OTP on the mobile and click Login. 8) After this you will see the name of the company, click on it. After following all the steps mentioned above, you will see balance, but if you wish, you can also download EPF Passbook for your convenience.